GREAT SMOKY MOUNTAINS NATIONAL PARK (understandably) draws much of the attention in terms of North Carolina’s public lands, but the Tarheel State is home to 41 great state parks that hold plenty of appeal of their own. From the mountains to the Piedmont to the coast, these resources invite visitors to climb high, trek far, dive in, and kick back. And with it being the 100th anniversary of North Carolina’s state parks system this year, public lands across the state will offer special programs and events throughout 2016. Best of all: You can get into all of the below state parks for free. Just south of Kill Devil Hills, site of the Wright brothers’ famous flight, the unique geography of Jockey’s Ridge State Park means visitors are able to give some rare recreational experiences a try. 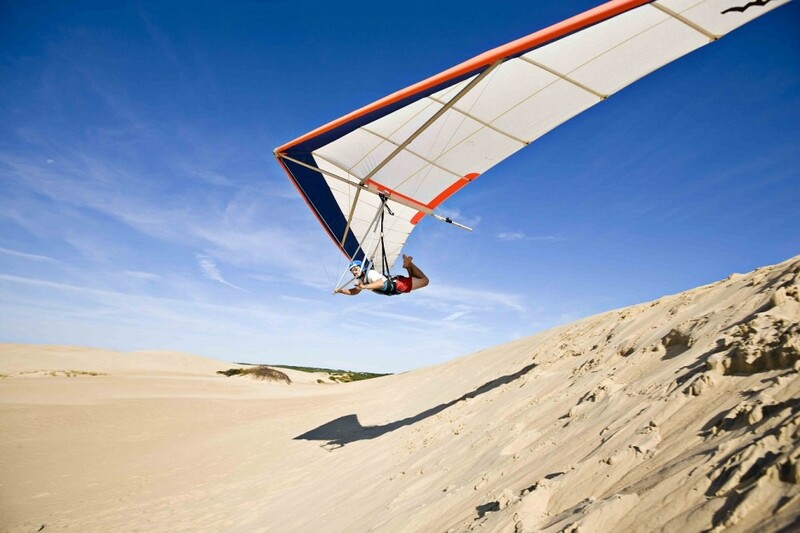 Located on the northern stretch of North Carolina’s Outer Banks and featuring the tallest active sand dune on the US Atlantic coast, Jockey’s Ridge’s elevation and constant winds combine to create perfect conditions for sand boarding, hang gliding, kite flying, and more. In the adjacent Roanoke Sound, kite boarders catch some excellent winds for their sport. The dune also offers a great spot for hiking, picnicking, or just catching some rays. Know before you go: Check the park’s website in advance for seasonal hours and current weather restrictions. For mobility-impaired visitors, call the park at least 24 hours in advance to reserve an all-terrain vehicle ride to the top of the dune. If you need to rent recreational equipment, make reservations in advance. Finally, although the sand may seem inviting, wear shoes — hot sand at 30 degrees above air temperatures can quickly burn bare feet, and sandspurs hurt! Located in the southernmost region of North Carolina’s coast near Wilmington, Carolina Beach State Park sits on the banks of the Cape Fear River a few miles before the waterway meets the Atlantic. Although many of its coastal offerings are pretty standard — sand, sun, camping, fishing — it stands out as a home to several native carnivorous plants, including pitcher plants, bladderworts, sundews, butterworts, and Venus flytraps. Unlike other plants that primarily pull nutrition from the soil, these species trap and digest insects for their energy, often in spectacular fashion. Venus flytraps snap shut in a fraction of a second when unsuspecting insects travel across their waiting snares. Know before you go: The Flytrap Trail offers the best views of the park’s “captivating” plant life, but when you see these threatened species in the wild, leave them be. Many local nurseries and gift shops offer propagated specimens for sale. Don’t miss the visitor center, which features interactive exhibits on the park’s unusual plant life as well as the local animals and area history. With more than 5,500 acres of woodlands inside the capital city’s Outer Loop, William B. Umstead State Park provides Raleigh residents and visitors to the City of Oaks with convenient access to plenty of nature. Hikers and trail runners will find 22 miles of trails designated just for them, and mountain bikers and equestrians share an additional 13 miles of forested pathways. The park also offers fishing and paddle sports on its three manmade lakes, plus sites for camping and picnicking. Know before you go: Those bringing horses into the park will need to check in at the visitor center with proof of a negative equine infectious anemia (Coggins) test. Boats can be rented on weekends from May through September at the Big Lake boathouse. Mountain bikers, take note: You don’t have to trek all the way to the western fringes of the state for a solid network of quality singletrack. Lake Norman State Park, 40 miles north of Charlotte, has 30.5 miles of mountain biking trails broken up in easy-to-manage sections ranging from one to 10 miles long. After you’re done riding, cool off at the park’s 125-yard-long swim beach, enjoy the breeze by renting a canoe or kayak at the boathouse, or get further out on the water for some wakeboarding. Kids will love the Dragonfly Trail, a paved, ADA-accessible path that features interpretive signage to introduce visitors to animals and plants you might encounter during your visit. 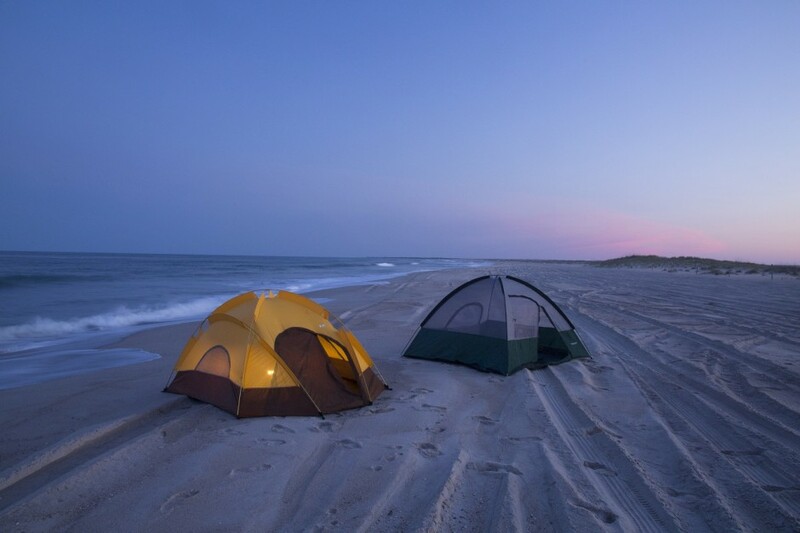 Know before you go: Like many North Carolina state parks, campsites here provide a range of amenities, so do your homework in advance to ensure you snag the perfect spot. If you’re a birdwatcher or are bringing the kids, stop in at the visitor center for plant and animal checklists. Wildlife of all varieties call this state park home. Named for its rocky knobs and outcroppings, Hanging Rock State Park features Cook’s Wall and Moore’s Wall, two expansive series of cliffs reaching up to 400 feet in height and stretching nearly two miles in length. Rock climbers come from all over the Southeast to attempt the range of routes available here. Overnight guests have their choice between rental cabins and campsites, and more than 20 miles of wooded hiking trails give visitors plenty of space to explore waterfalls, caves, cliffs, and Instagrammable outlooks. Know before you go: Although it’s free to enter and climb in the park, climbers do need to register and secure a permit at the park office or climbing access points. Climbers are responsible for providing their own safety equipment. Swimming and renting canoes or rowboats involve a small fee. This park’s namesake 6,684ft peak steals the show as the highest point in the Eastern US, and visitors can take advantage of the summit’s easily accessible observation platform, which gives 360-degree views of the surrounding spruce-fir forest. Wildlife like northern flying squirrels and peregrine falcons make the hiker experience especially memorable in what was North Carolina’s very first state park. Know before you go: Black bears live in the park and pose a danger to humans, but taking steps like storing food in bear-proof containers and properly disposing of trash significantly minimizes any risk. Review bear guidelines on the park’s website or speak to a ranger for information. Also, wear or carry layers of clothing to prepare for the park’s high elevations. It’s all about waterfalls at the rugged Gorges State Park, an hour and a half southwest of Asheville. There’s a multitude of cascades here, many of which are hidden deep within the park as rewards for dedicated hikers. Primitive campsites also enhance the experience of solitude at Gorges. Don’t skip the visitor center — its exhibits highlight special park features, including information on rare plant species and details on hidden waterfalls you may otherwise miss. Know before you go: Gorges State Park is a carry-in/carry-out facility, so be prepared to pack out any trash you generate during your visit. Some trails aren’t recommended for beginning hikers, but park staff can offer suggestions based on your experience and fitness level. There’s a section of trail open to mountain biking at Gorges as well. There are so many more state parks in North Carolina, and each has something unique to offer. To find your perfect park, check out visitnc.com/parks.